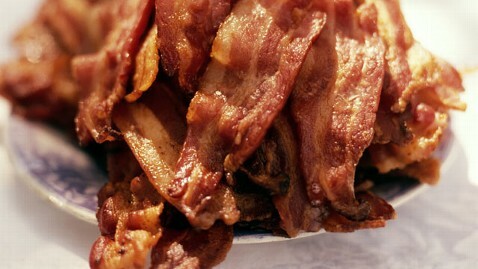 Who doesn't love the smell of bacon in the morning? Let's hope that people with chronic nosebleeds really love it, because doctors have found new evidence that strips of bacon inserted up the nose can stop nosebleeds. Yes, it's true. A report published in the Annals in Otology, Rhinology and Larynology found that strips of "cured salted pork crafted as a nasal tampon and packed within the nasal vaults" successfully stopped a 4-year-old girl's nosebleeds. The doctors who treated the girl at the Detroit Medical Center speculated that the meat may have certain tissue factors that help the body stop bleeding. The authors noted that this was the "first description of nasal packing with strips of cured pork for treatment of life-threatening hemorrhage in a patient with Glanzmann thrombasthenia," a rare genetic disorder that causes chronic nosebleeds. Despite some evidence that the bacon craze may be going too far (here's looking at you, Bacon Lube), the surprising treatment isn't necessarily a sign that society has become a little too bacon obsessed. Doctors of yesteryear apparently knew much about the curative powers of cured pork. According to a report in the Guardian, doctors in the 1940s and 1950s reported the benefits of salt pork in stopping the occasional nosebleed. Eventually, doctors may have turned up their noses at the practice because of "bacterial and parasitic complications," as well as improved medical techniques, the authors of the current study speculate. But eating bacon is another story . A recent study in the British Journal of Cancer found that eating a single daily serving of bacon, sausage or other processed meat may increase the risk of pancreatic cancer. And that should be enough to curb anyone's enthusiasm for a while.